The 39-year-old Dubliner is a stroke clear of Ryder Cup parnter Ross Fisher after a round that featured seven birdies and a solitary bogey at the 17th. World No 1 Lee Westwood, who could lose his place at the top of the rankings this week if Tiger Woods claims the Chevron World Challenge in Los Angeles, sits alone in third place thanks to a four under 68. Chasing his second win of the year, a handful of world ranking points and a winner’s cheque for $1.25m, Harrington parred his first seven holes at the Gary Player Country Club before going on the attack. He birdied the eighth, ninth, 10th, 11th and 14th to share the lead with Fisher before play was suspended due to a thunderstorm. When play resumed, he birdied the par-four 15th to get to six under and while he dropped a shot at the 437-yard 17th, he brilliantly birdied the last from four feet to take the outright lead. Harrington, who has dropped to 22 in the world rankings, is obviously still struggling with aspects of his game as he made a hasty exit after his round to work out on the practice range, snubbing the media in the process. He made a nervous start with a shoddy double bogey six at the first but Shane Lowry dug deep to birdie two of his last four holes and open with a level par 72 in the $6.5m Nedbank Golf Challenge in South Africa. 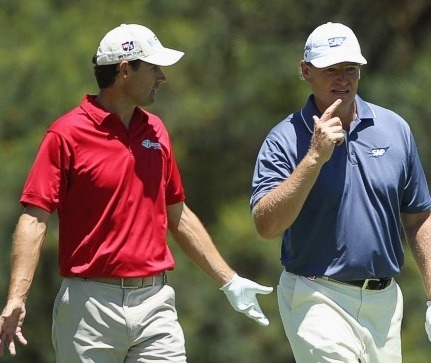 Padraig Harrington does not believe his season has been a complete disaster. He missed the cut in three of the four majors and dropped from fifth in the world at the start of the year to 22nd heading into this week’s Nedbank Golf Challange. But he says he’ll try to remember 2010 for his win in the Iskandar Johor Open in Malaysia, his rash of top-10 finishes and his role in Europe’s Ryder Cup victory. Padraig Harrington’s faint hopes of mounting a weekend challenge to Lee Westwood in the $5m Nedbank Golf Challenge evaporated quickly on a scorching day at the Gary Player Country Club in Sun City.